The VGA Extender transmits VGA video up to 300 feet away from a computer using CAT5/5e/6/6a cable. Each video extender consists of a local unit that connects to a computer and also supplies video to a local monitor, and a remote unit that connects to a monitor. Local unit: 110 or 220 VAC at 50 or 60 Hz via AC adapter (included). Remote unit: powered from local unit via CAT5/5e/6/6a cable. Note: CAT6/6a cable has a higher skew than CAT5/5e cable, which causes colors to smear. 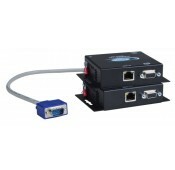 Since these extenders do not have internal skew compensation, they work at shorter distances with CAT6/6a cable.